Findings: "Although visually similar to Lewitt’s LCT 640, their new LCT 640 TS sports a twin diaphragm capsule and incorporates Lewitt’s integrated capsule matching system. 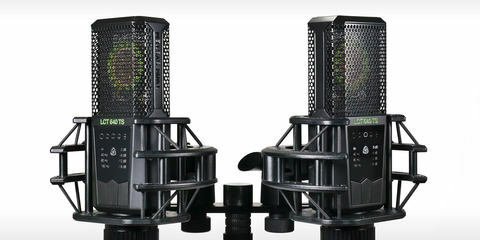 The TS stands for Twin System: it works either in regular multipattern mic mode, or in dual mode, providing independent access to both diaphragm outputs. This allows adjustment of the pickup pattern after recording and also opens up some stereo recording options. Switching through the five patterns in regular multipattern mode reveals a uniform sounding mic which is bright though not overhyped in the high frequencies, with solid though not overly woolly low mids. For the directional patterns proximity isn’t overbearing, and the three low cut settings provide plenty of options for taming rumble and proximity. In dual output mode you need to hook up the second output to a second phantom powered mic pre with identical gain. With both outputs recorded to individual tracks you can then decode the signals. To do this manually Lewitt include level and polarity instructions. However, the simpler option is their free Polarizer plug-in. This takes a hard panned stereo input (front diaphragm left, rear diaphragm right) and outputs a dual mono signal. Its smooth slider moves from omni at one end via cardioid and super cardioid to figure-8 in the middle, then the back diaphragm becomes the front as it continues through similar options to a phase inverted omni at the end. By turning the LCT640 TS side on to your sound source, the twin output also opens up stereo options. Panning the outputs in opposite directions delivers a stereo image with the pan amount adjusting the width. Or bouncing these signals via Lewitt's Polarizer Plug-in to create two individual signals, figure-8 and omni, provides the source signals required for manual mid side (MS) decoding. Impressive, and although you’re primarily relying on the off axis frequency response of the diaphragms for the phantom centre, it sounded pretty good. 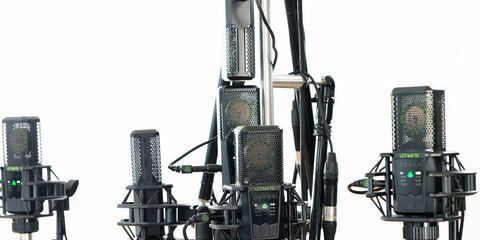 Overall, the LCT640 TS is a fabulous mic and you get a lot of functionality for your money." We want to thank Andrea Rocca for publishing this super informative and revealing review about studio life with the LCT 640 TS. Andrea tested the microphone while recording acoustic guitar, vocals, bongo, eggshakers as well as a fuzzy electric guitar. "Comparing it with an AKG C414 XLS setup with similar settings, the LCT 640 TS has a more flattering quality to it.